Let’s face it, most pear tart recipes are complicated. You have to make the dough, then let it rest. Next you have to pre-bake the crust, or maybe go out and get some frozen puff pastry. I’ve even seen recipes calling for making the puff pastry at home (not happening). Or, there are recipes requiring a traditional full-blown pie crust. I have a lovely apple pie recipe I hardly ever make because it’s just too much fussing. This rustic pear tart, on the other hand, is fairly easy and straightforward. You don’t have to crimp the edges, or pre-bake the crust. You don’t even have to cook the pears in advance. I saw one recipe that had 22 steps! Nope. Nope. Nope. This recipe is much easier than that! There are only six steps. Much better! The active time is about 15 minutes of work, and the whole thing is done in about an hour and a half (including resting in the fridge and baking). First you make the dough. That’s only six basic ingredients you likely already have at home. Then, you let it cool in the refrigerator for an hour, and press out the dough into a roughly circular shape. Next, add the fruit, sprinkle the spices on top, and bake. 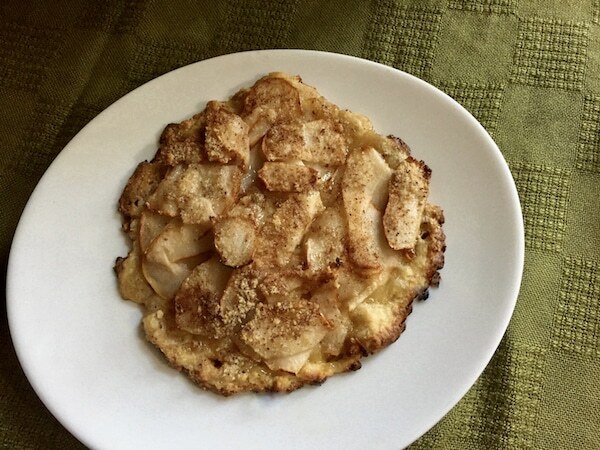 I’ve made this tart with pears, because I had some extremely ripe pears I wanted to use up. If you don’t have pears, or would rather use something else, apples will work beautifully too. And, both are in season now. Once summer comes back around, you might try it with peaches or maybe plums too. The original recipe (which I cut in half) required a food processor. If you don’t have one, you can use a pastry cutter or two sharp knives instead. I have included instructions for both. If you have a food processor, add the flour, sugar, and salt to the food processor bowl and pulse for a second or two. If not, add the ingredients to a mixing bowl. Cut up 4T of the butter into pieces, and add that to the bowl. Then add the egg yolk. Pulse (for the food processor) for about 10 seconds until it's all mixed together. If using a bowl, cut the butter up with a pastry cutter or two knives. It should be the size of small peas. Then mix everything together. Add the cold water, one tablespoon at a time, until the mixture is moist enough to form a ball. Then wrap it up in plastic wrap and refrigerate for an hour. Take the ball out of the fridge and preheat the oven to 400 degrees. Let the dough warm up as the oven comes to temperature. This will make it easier to handle. Pat the dough into a rough circle, pushing outward from the middle with your hands. Then place it on a non-stick cookie sheet (if you don't have one, line it with parchment paper). Arrange the pear slices on top. You can line them up carefully, or just toss them casually on the crust. Sprinkle the tart with the brown sugar, cinnamon, nutmeg, and ginger. Then add the remaining butter, cut up into little pieces, and dot the tart with it. Bake for 20-30 minutes until the crust gets brown and the fruit is juicy and tender. Top with whipped cream or ice cream. I’ve been craving pear bread ever since I saw some in the store the other day. The store version was much too big for one person, so I ran to the Internet. I started out thinking I would make the Smitten Kitchen pear bread. But, that turned out to make two loaves. I’d never be able to eat two loaves of bread before it went stale. Even a single, full-size loaf was more than I wanted, especially for an experiment. So I kept looking. 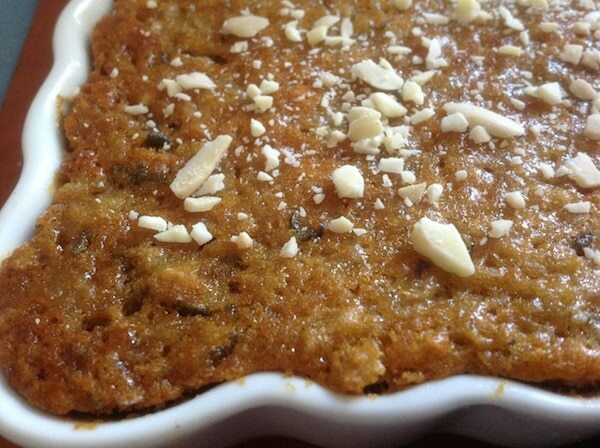 Then I found that Desserts for Two had a banana bread recipe that, with some tweaking, would do nicely. So, ginger pear bread was born. I didn’t want to play around with reducing the sugar, but I was concerned that 3 tablespoons of sugar plus the honey plus the pears would be too sweet. So, I balanced the sweetness of the pears with the bite of some cinnamon and a bit of ground ginger. Ginger is both sweet and spicy, depending on what other flavors you combine it with. I topped the whole thing with some chopped almonds. They were supposed to go in the bread mixture, but I forgot! One warning though, when you finish mixing the combined ingredients, the result will look a bit odd before you bake it. However, the finished bread is delicious. Ginger pear bread is sweet and slightly spicy. Peel the pear, slice it in half, and remove the core. Add the butter, sugar, and the honey and stir it all together with a spoon. Add the egg yolk and stir the mixture again. Now add the dry ingredients: flour, baking soda, salt, and the nuts. Stir that all together and pour into the prepared pan. Bake for 35-40 minutes until a toothpick comes out clean. Sprinkle with additional nuts if desired. Dip the spoon in water before you measure the honey; that way it won’t stick. Use the leftover egg white for meringues or to brush the top of homemade bread (the white will give it a lovely shine).